Ten years ago, Atlanta’s Grady Hospital was facing insolvency. A group of business and civic leaders stepped in, raising hundreds of millions of dollars, to transform the aging hospital into providing best-in-class healthcare for the uninsured and underinsured. Citizens Trust has been a fixture on Auburn Avenue for decades, but it will soon call Peachtree Street home. The bank was known for lending money to African-Americans who couldn’t borrow money from white-owned banks. Gaines Hall, built in 1869 as a dorm for Atlanta University, caught fire on Aug. 20. The next day, the Atlanta Fire Department said the historic building should be torn down for safety reasons. But local preservationists immediately objected, saying Gaines Hall can and should be saved. Atlanta has a pretty dismal record when it comes to preservation. All too often, vacant older buildings suffer from a condition known as demolition by neglect ─ they fall victim to the elements or catch on fire ─ giving property owners an excuse to tear them down. And it’s rare for local governments in metro Atlanta to stand in the way of demolition. It’s even rarer for them to find a permanent solution to preserve historic buildings. So it appeared as though Gaines Hall was doomed. The dorm had been owned by the struggling Morris Brown College, until earlier this year, when it was acquired by the city of Atlanta. Would the fire seal its fate? That’s when Atlanta Mayor Kasim Reed came to the rescue. After all, Gaines Hall had been the stomping ground for leading African-American scholars like W.E.B. DuBois, among others. The next day, the city sent engineers as well as the head of planning, the head of Invest Atlanta and the head of real estate to examine the building. The official line is that they’re trying to assess the damage to see if it can be saved. But Mayor Reed, someone who rules with an iron fist, has let his feelings be known. And city officials will be more motivated to preserve Gaines Hall rather than demolish it. While I’m not always a fan of the mayor’s heavy-handed style, I have seen it work once before in saving a building. The city had given Atlanta Housing Authority permission to demolish the Trio building in the King historic district. Mayor Reed agreed. And he controls most of AHA’s board members, so the historic building is being saved. Just like the Trio building, preservationists are standing by, ready to help. Mark McDonald, CEO of the Georgia Trust, said the Hancock County Courthouse in Sparta, designed by the same architect, had even worse fire damage than Gaines Hall. But Hancock County officials are preserving it. If Sparta can do it, so can Atlanta. For Gaines Hall to be a real success, we need to not only save the building. We need to give it new life so that it won’t fall victim again. Mayor Reed, you can be an even greater hero if you come up with a permanent solution for Gaines Hall, one that will keep it standing for generations to come. The new principal owner of the Atlanta Hawks, Tony Ressler, closed the deal on the city’s professional basketball team on June 24. At his first press conference, 24 hours later, the Los Angeles businessman said the team would now speak with one voice … a marked contrast to the past owners, the Atlanta Spirit Group. Atlanta has welcomed Ressler with open arms. He enters the scene as the new lead owner of the Hawks, without baggage and with great hopes. Maybe now we can get an NBA championship. Maybe now we can have a unified ownership group. Maybe now we can have a leadership group with no trace of tension or racism. With former NBA player Grant Hill by Ressler’s side, the leadership duo reflects the diversity in Atlanta — and the entire country. But there are a couple of yellow flags. 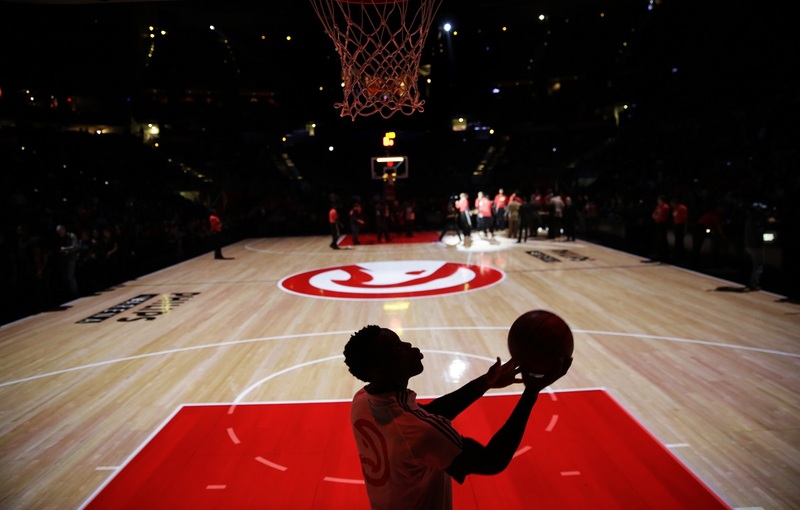 Ideally, the lead owner of the Hawks would call Atlanta home. An owner who has deep roots in our community is less likely to move the team to another city. Living in Los Angeles and going to basketball games in Atlanta is less than ideal for Ressler and his family, although they have bought a residence in Buckhead. When asked if he would commit to keeping the team in Atlanta forever, Ressler wiggled his way out of a straight answer. Maybe it’s just a negotiating ploy. But Ressler is on record saying that Philips Arena will either need to be remodeled or replaced, that doing nothing is not an option. Will he commit to keeping the Hawks downtown? Ressler said he is not ruling out anything. This is beginning to sound like an expensive proposition for Atlanta. Perhaps Ressler is not aware that Philips Arena is one of the most successful entertainment venues in the country. It has consistently ranked in the top five arenas in the nation, only surpassed by Madison Square Garden over the years. What a shame it would be if it gets caught up in the frenzy of discarding our relatively new facilities for even newer and more expensive venues for pro sports. Let us hope Ressler comes to fully appreciate our downtown and our arena … that he doesn’t get us into a bidding war with a western city like Las Vegas, or that he doesn’t uproot the Hawks from the heart of Atlanta, next to MARTA, for the suburbs. The symbol for Atlanta is the phoenix rising from the ashes, an apt metaphor for the Atlanta Hawks. Last season started in a firestorm and ended with the team having its best record ever. A new owner gives us hope the magic will continue. Please Tony Ressler – don’t let Atlanta down. Veritiv’s Mary Laschinger would be the first female CEO of a Fortune 500 company in Georgia. Few people have even heard of the company Veritiv. But by next year, it will become one of Atlanta’s best-known companies. That’s because it will have the first woman CEO of a Fortune 500 company based in Georgia. When the company eventually is included on the Fortune 500 list in 2016, it likely will be ranked near No. 300 – thanks to its sales of about $9.3 billion a year. Veritiv formed last July through a merger of Unisource and a division of International Paper – xpedx. The company held its first annual meeting this Wednesday. And its CEO is Mary Laschinger, formerly a key executive at International Paper and the CEO of xpedx. Up until now, women have not fared that well at the top of the corporate ladder in Georgia. Women were passed over in two recent high-profile opportunities. At Home Depot, three internal candidates were being considered to succeed Frank Blake as the CEO. Carol Tomé, who had served as the company’s chief financial officer dating back to the founders, had as good a shot as any. But the top job ended up going to her colleague, Craig Menear. The other lost opportunity was Newell Rubbermaid. Again, three internal candidates were being considered – including Penny McIntyre, who was running half of the business. The job ended up going to a director – Michael Polk. Sadly, few women are being groomed to be the next CEO of Georgia’s major companies. OnBoard, an association that tracks the percentage of women on Georgia’s corporate boards as well as those sitting in the executive suites, sees much room for improvement. Only 10 percent of the top officers in Georgia’s public companies are women, and only 11 percent of all the directors on Georgia’s corporate boards are women. So when Veritiv picked Atlanta as its headquarters – over Cincinnati, Charlotte and Dallas – Atlanta not only got a new Fortune 500 company. The greatest gift was having Mary Laschinger appear on the scene. Laschinger is already serving on the board of the Metro Atlanta Chamber. She’s looking forward to putting down her roots in Atlanta and making sure Veritiv becomes engaged in the community. Given the scarcity of top women executives in Georgia’s business community, Laschinger will have ample opportunities to be a role model and set an example for other companies around the state. So welcome to Mary Laschinger. You are giving women in Georgia a reason to celebrate. When NCR ─ a Fortune 500 company based in Gwinnett County ─ held its annual meeting last Wednesday, the only way one could participate was online. It’s the first time in Georgia’s history a major public company held a virtual annual meeting. So NCR shareholders were unable to interact with the executives and directors running their company. The meeting was only available online in audio ─ not even video ─ and not one shareholder asked a question. Not surprising. An online-only meeting is an unfriendly forum for shareholders. It leaves the impression that a company has something to hide. Or that a CEO does not want to meet shareholders face-to-face. It’s not a good idea folks. Nationally, more companies are choosing to go virtual with their annual meetings. Last year, 53 companies went to online-only annual meetings compared to 21 in 2011. Companies say they are cheaper to hold and more shareholders can participate. But there has been a backlash. Angry shareholders forced Intel to abandon its online-only annual meeting format in 2009 so it went back to a “hybrid” meeting. People can show up in person or can participate online in a hybrid meeting. More than 500 U.S. companies are holding hybrid annual meetings, including several in Atlanta like Coca-Cola. I am one of those strange people who enjoys going to annual meetings because they tell me so much about a company. It is an opportunity for me to see the diversity on a company’s corporate board and its top management. They let me see how executives interact with shareholders, employees and the public. In short, they tell me a great deal about a company’s culture. And that cannot be captured virtually. Annual meetings also keep executives on their toes. Remember when Home Depot CEO Robert Nardelli held an annual meeting in 2006 with no directors present. He was gone from Home Depot a few months later. NCR is moving its corporate headquarters from Gwinnett County to Midtown. It is considering options to sell part or all of the company. At next year’s annual meeting, NCR should welcome its shareholders both online and in person. The Atlanta Streetcar. People instantly have an opinion ─ regardless of the facts. Some call it a boondoggle. Others say it doesn’t go where they want to go.